Imagine the most elegant of dinner parties. The meal: a ground snake. Your guest: a tarantula. No silverware necessary, as your dining partner has brought its digestive juices with it. This party took place one afternoon around 1:30PM on October 23, 2015, in the beautiful Serra do Caverá in far southern Brazil. A team of scientists happened upon the meal—a 15-inch dead Erythrolamprus almadensis snake—decomposing in its middle section beneath an overhanging rock. And our lovely dinner guest, the large Grammostola quirogai tarantula, was there atop the prey, turning the serpent’s body to goo with its out-of-body digestion, according to research published last month in the journal Herpetology Notes and first reported by Live Science. The scientists kept the snake corpse. It turns out, tarantulas eat a lot of giant things, and scientists have forced them to eat snakes in captivity before. Scientists have observed other spiders eating snakes, too, like this example from South Africa. 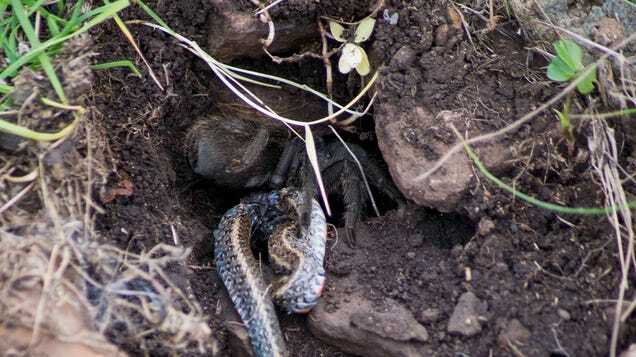 But to the best of the study authors’ knowledge, this is the first time someone has observed a tarantula eating a snake in the wild. Leandro Malta Borges, the study’s first author and a graduate student from the Universidade Federal de Santa Maria in Santa Maria, Brazil, is no stranger to spotting the most horrible dinners ever conceived. I found his name on other papers in Herpetology Notes, your number one source for open-access science articles about bugs eating lizards and amphibians. To the left, you’ll see another scenario Malta Borges had the privilege of studying: the Aglaoctenus oblongus spider munching on a tree frog. And while we’re on the subject of horrible dinners, here’s another photo from a Herpetology Notes paper, this one of “a female pisaurid spider (Thaumasia velox) subduing a female Dendropsophus microps,” taken by scientists at the Universidade Estadual Paulista in Brazil back in 2012.